Selling your home is likely something you don’t do very often so you will have to trust the guidance you receive from your agent. To ensure that agent is giving you the best advice with no ulterior motives, your state requires they maintain a license. States regulate who they allow helping buy and sell homes, as this is often the largest investment a single person or family will make in their lifetime. The transaction involves a lot of money and the knowledge required to make an informed decision is not always easily accessible, so there is ample opportunity for fraud or just plain poor judgment. States want to make sure they protect consumers as much as possible, so they require real estate agents to obtain a license before they can consult on a transaction. A note on terminology: you will see real estate agents referred to as listing agents, sales agents, real estate agents, etc. All of these terms are interchangeable. To obtain a real estate salesperson license (which allows you to represent both buyers and sellers), you must submit an application to your state government’s real estate division, pass a background check, finish three college-level education courses, and pass a written exam. Once you achieve these things, you are still only qualified to work under the supervision of a broker. Brokers are real estate sales agents that have completed at least 45 additional hours of continuing education, they have either a college degree or the designated years of experience their state requires, and they’ve passed an additional written test. Don’t expect to hire a broker to sell your house. They might appear to have more experience than sales agents since they have the more advanced designation, but some brokers don’t actually work in the field and instead provide legal oversight for their team of agents (as is required by law). Some sales agents have just as much experience as the broker under which they hang their license, they just haven’t taken the broker’s written exam yet. How Does Their License Help You? Despite the fact that it’s illegal for someone to value your property, give you real estate advice, or draw up a purchase contract without a real estate license, it also could put you at risk financially. 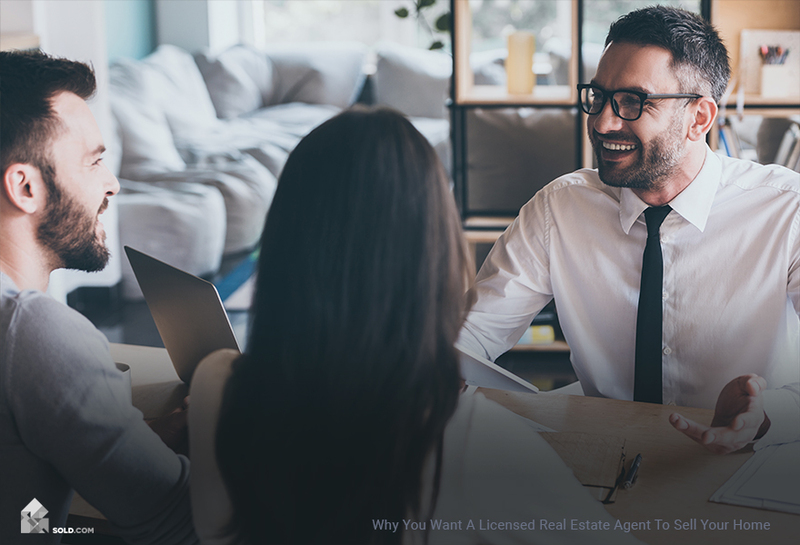 One of the requirements for maintaining their license is that real estate agents complete at least 45 hours of continuing education per year. Ongoing education is important because of the laws governing the industry change from year to year. And unless the agent knows which seller disclosures are mandatory and what forms are currently required for any special type of transaction or ownership structure (e.g. TIC, a trust, etc. ), then you could make a mistake that blows up your sale, lands you in the middle of a lawsuit, or simply costs extra money down the road. So when we say your agent’s license helps you, we mean the education they receive helps to make them more informed — which means you will be more informed as well. Most states now require real estate agents to provide their license number on business cards, email signatures, and on any marketing communications or websites. So while you’re researching potential hires, look for the word “License,” or the abbreviation “Lic. #” followed by a seven-digit number. If you happen to live in one of the few states that don’t require agents to offer their license number and you can’t find one on their website, simply call and ask. Once you have the license number, you still need to make sure that it: a) belongs to them (sometimes fraud happens) and b) that it’s still current. Unfortunately, agents will often practice with a lapsed license because their license was suspended for unethical behavior, they didn’t complete the continuing education, or they didn’t pay their renewal fees — all of which are red flags and should make you wary of working with them. So once you have the license number, go to the website for your state government’s real estate division, identify yourself as a consumer, and then enter the license number into the search field. Most states track all complaints filed against agents and the punishments levied. They will show you when the license was issued (so you know how long they’ve been practicing) and the last time it was renewed. There are a lot of moving pieces when buying and selling a home and you will most likely have to depend on the information and advice your agent is giving you. You want to be able to trust their motives and judgment. By choosing a licensed real estate agent whose background is clean, you can rest easy knowing they will act in your best interest.